The state Tax Reform and Relief Task Force on Tuesday adopted a proposal by the panel’s co-chairs to back potential legislation to cut the state’s marginal tax rate to 6%, as well as backing another measure to join the growing list of states to cash in on remote or Internet sales tax bounty. The two proposals were among a working list of nearly 20 corporate and income tax proposals and exemptions that lawmakers have sifted through for nearly a year to decide if certain exclusions that reduce state revenue are justified, need to be changed, or nixed from Arkansas’ tax structure. The most widely debated proposal moving forward, according to lawmakers attending the meeting, was a measure submitted by the panel’s Republican co-chairs, Sen. Jim Hendren of Sulphur Springs and Rep. Lane Jean of Magnolia. That proposal, which includes two options, would cut the individual income tax rate for the highest earners from 6.9% to 6%. Arkansas now collects a state corporate income tax at a maximum marginal tax rate of 6.5%, spread across six tax brackets. For individual income taxes, marginal brackets ranged from 0.9% on the low-end to 6.9% for the highest tax bracket. The Hendren-Jean proposal was first floated by Gov. Asa Hutchinson earlier this year as part of his ongoing economic agenda to cut taxes across-the-board for income levels. After visiting with farmers across south Arkansas as a part of his 2018 Agriculture Tour, Hutchinson applauded the task force’s efforts today. According to details of the Hendren-Jean plan, so-called “Option A” would reduce the number of individual income tax tables from three to one and reduce the top marginal rate for individuals from 6.9% to 6.5%. Because Option A does not raise any individual income tax rates in calendar year 2018, it would not require an emergency clause and a three-fourths vote of both houses of the General Assembly. Similarly, “Option B” would also reduce the number of individual income tax tables from three to one and give relief to those making at least $80,000 annually. However, Option B would raise the individual income tax rates for wage earners with income less than $21,000 under Act 78 and Act 79 of 2017 enacted by the legislature. It would, however, require an emergency clause and a three-fourths vote in the state Senate and House because it would repeal the 2017 law and result in a tax hike for some taxpayers in the lower brackets. Based on a Department of Finance and Administration analysis in late June, Option A would result in an estimated revenue loss of $276.4 million and Option B would result in a decline of nearly $125.8 million annually. Beside Hutchinson’s tax plan, the task force also moved forward a proposal by Rep. Jim Dotson, R-Bentonville, that would require out-of-state remote sellers with more than $100,000 in annual sales that do not have a physical presence in the state to collect and remit Arkansas sales and use taxes. Dotson’s plan also states that any revenue collected because of this proposal would be dedicated to reducing taxes, including a repeal of the state’s 4.5% income tax rate for middle-income earners. That measure would add $35.4 million to state budget coffers, including a $24.5 million spike in general revenue, DFA analysis shows. At the end of the 2017, similar legislation was rejected after fierce debate on the Arkansas House floor by a vote of 43-50, with seven members not voting. However, the U.S. Supreme Court issued a ruling in late June in the case South Dakota v. Wayfair Inc., upholding that state’s requirement that large-scale online sellers without a physical “nexus” in the state must collect and remit sales and use taxes. Since the high court’s ruling, by a thin 5-4 margin, several states have announced plans to begin collecting sales taxes from online retailers. The decision by the Arkansas tax reform panel, however, did not sit well with Democrats in the legislature who helped to defeat a similar proposal in the 2017 regular session. “We are supportive of the decision to collect sales taxes from online and remote sellers, because it helps our in-state retailers and will increase revenue for Arkansas. But we shouldn’t commit that increased funding to tax cuts. We should use the revenue from internet sales taxes to rebuild our roads and bridges across our counties and to raise the pay of our state’s teachers,” said Rep. Michael John Gray, D-Augusta, and chairman of the Democratic Party of Arkansas. Gray and Sen. Joyce Elliott, D-Little Rock, also criticized the 16-member task force’s decision not to support legislation to create a state-run Earned Income Tax Credit (EITC) program. That proposal, submitted by Elliott, would give low-wage taxpayers refundable tax credit in an amount equal to 15% of the amount that same taxpayer received under the federal EITC program. 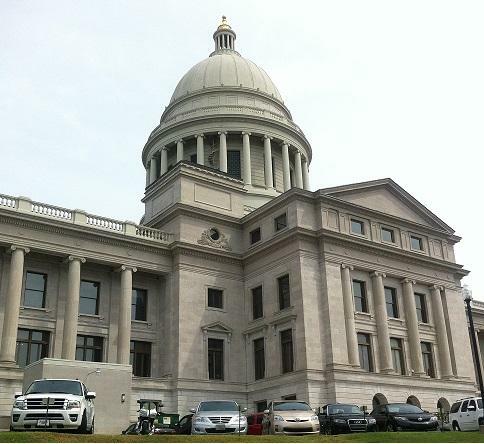 “The Task Force … just voted to not even CONSIDER an EITC for low income Arkansas. Not even consider. But did vote to do what you see in the screenshot. You decide who matters,” Elliott tweeted during the task force’s morning meeting, highlighting the panel’s support of the governor’s tax cut proposal. Gray, who also supported an EITC bill that was defeated in the House tax committee in the 2017 session, said Elliott’s measure had broad statewide support and has proven to stimulate economic growth at the state and federal level. Besides the panel’s backing of the Hendren-Jean tax cut plan and Dotson’s remote seller proposal, other proposals recommended by the 16-member bicameral panel will be included in a draft report as potential bills for the upcoming 2019 General Assembly that begins in January. By law, that report must be submitted to Gov. Hutchinson by Sept. 1.